Disappearing Acts is not a retrospective. 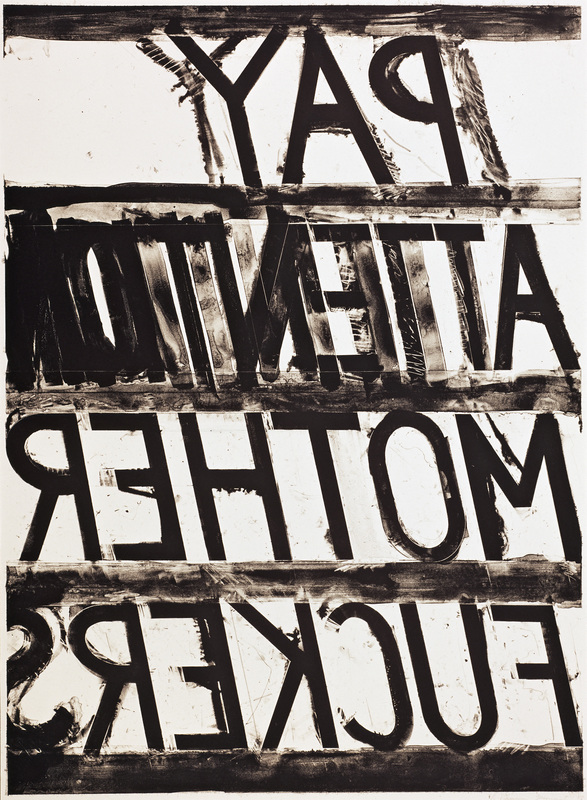 It’s arguable that the phrase is moot within conceptualism and to use it here perhaps runs contra to Nauman’s oeuvre. In the same way this exhibition arranged over two sites – PS1 in Long Island City and MOMA in Manhattan – follows no real chronology. 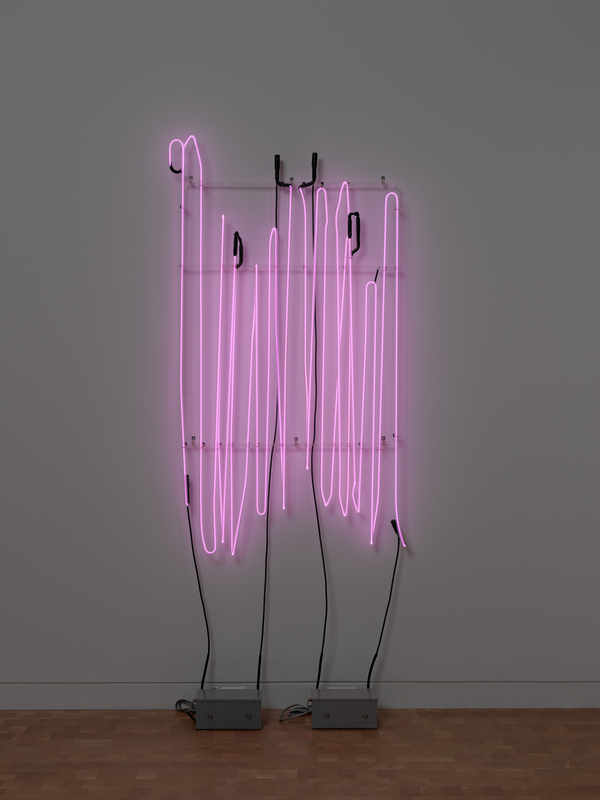 Nauman deals too closely with the instability of time to afford it to license and file his work in any created order. 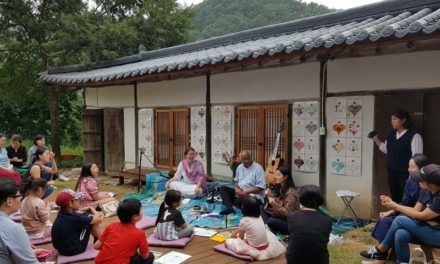 Constantly, we seem to need to look for the human behind the artist or writer, we seek to humanize any art to place ourselves within its context. This has become a natural act, but it’s more about our placement than that of the creator. But with Nauman and indeed Disappearing Acts, there really are no maps and no timelines, neither are we guided, literally. At PS1 we happen upon his work and there is no structure for the same reasons. There are decade-wide periods of Nauman’s work, but no defining identities and no history, and so we move through the floors and visit the young Nauman and older Nauman. And sometimes we see no Nauman at all. We learn that Nauman the creator does not conceptualize a piece into being but the reverse. He creates the work and then figures out what he has created. A reverse osmosis is perhaps why each piece has its individual status, with each one being an epoch unto itself. Nauman isn’t an artist who flogs an idea until it’s dead. His synapses fire at an alarming rate particularly in the early stages, as they do with us all, then slow as we grow older. Of itself, this is both a statement of humanity, and an existential moment at the same time. If time is indeed present. It’s also about disappearance. About what happens when the artist isn’t present, leaving only the void they created. Whether that’s a space we know exists but don’t see (A Cast of the Space Under My Chair. 1965-66) or soundscapes that we witness only by walking past (Days.2009) – voids we know are there or sound that we can only witness with our presence. It is here misplaced days of the week are emitted through a line of speakers which then becomes a sculpture – sculpture only exists when in our presence. 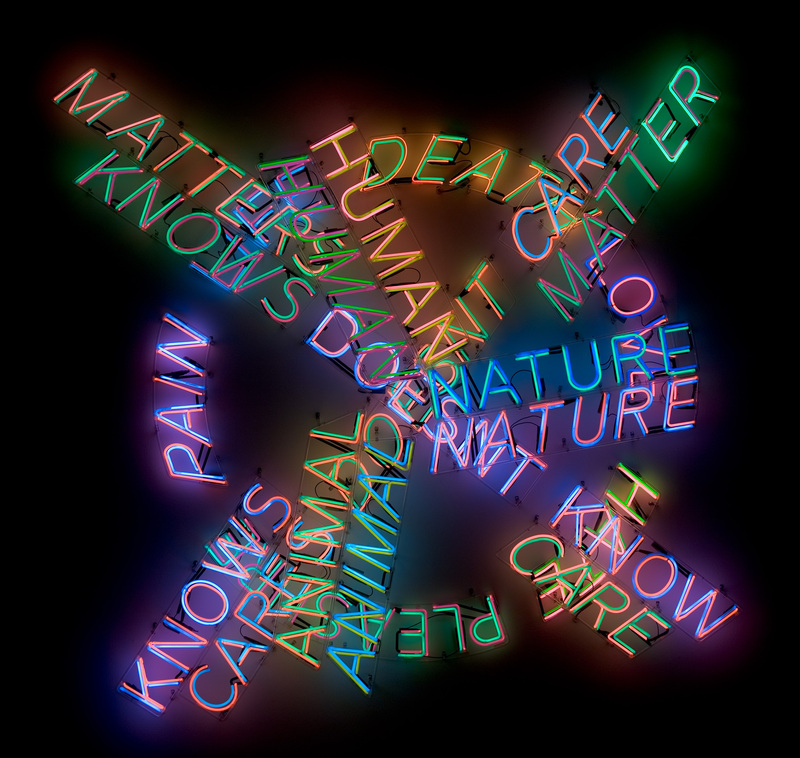 Nauman’s work is not just physical but philosophical – a place where the tangible meets the intangible. The biggest jump is showing the invisible. In the 1966 performance/film/site and environmental, Span, Nauman builds a wooden frame over a rivulet upon which he drapes a tarpaulin. The film created shows us the movement of the wind that happened at the time. Without this we could not witness Nauman bringing the invisible into existence on the same bank of the river in 1966. The wind is there with or without the tarpaulin blowing the artist has to show us. The True Artist Helps the World by Revealing Mystic Truths (1967). He also plays with his tag – his name – both sonically and visually. My Name Exaggerated 14 times, vertically (1967,) – the visuals of sound. Neon signatures, 6 inches of his knee stretched out to several feet, his hand and mouth as the same sculpture and a dark room with a menacing rasping voice Get Out of my Mind, Get out of This Room (1968). There’s also something Kintsukuroi, or the Japanese ‘golden repair’, about the work. The highlighting of imperfections and cracks of pottery with molten gold, making us aware of everything around us. Highlighting the spaces between everything. The body of work of the 1980s’ brings in textual neon alongside pornographic imagery, at a time where semiotics and texts merged to form the late structuralism of linguistics and anthropology. Fellow travelers are present but not name-checked – save Wittgenstein earlier on. Nauman’s mid-1980’s was a period of text and panopticism, the latter running in tandem with the surveillance theories of Foucault. A time of binaries, men and women, good boys and bad boys, of dot and dash, of zeros and ones and the birth of computerese. Nauman’s admiration of the philosopher’s ability to develop an argument to the point where logic and language break down is always clear. Eating my words (1966) has him doing just that, the Self Portrait as Fountain (1966) and Feet of Clay (1970) all play on this. Lead exhibition curator Kathy Halbreich states that Nauman dealt with surveillance and politics as early as 1970. He explained it then as his reluctance to tell you what to believe and again brought about the instability of what truth is. Now relabeled for millennials as “Fake News” and “Self-policing” running tandem with an iPhone. It seems that everything that Nauman has ever created has everything to do with the world we now live in and nothing has ever been out of date. As always, we refuse to listen to the artists and the poets until it’s time for their “retrospective” because ultimately we’re merely contented fools. Perhaps the work on paper which hang as studies, should by rights not be labeled so because of Nauman’s reverse methodology of conceptualizing after the creation. But again, this could just be me being the usual sap looking for some human identity within the universality of a body of monumental work. Then again, we humans only really make any sense of things in retrospect. But the artist here is ever present. He’s there as a young and old man, sometimes repeating the same habitual contrapposto (against the body) studio struts. Still, ‘the self’ as art, against ‘the self’ as mortal – continuing until it continues no more, leaving only the absence of things – is a place where real things happen. The mice run across the studio floor when the artist is absent. Things move. Qualifying Nauman’s early assumption that, as an artist, everything he makes in that studio is therefore – art. 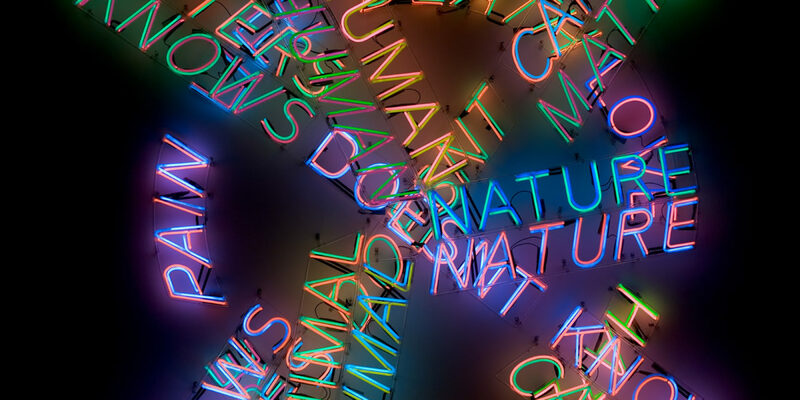 Perhaps the world has followed Nauman’s narrative without ever realizing it. Maybe it’s led us to the era of fake news and the questioning what the very nature of truth is, all of which he encouraged. It’s here that the semiotics of a neon sign comes from the philosophy of a liquor store – Pay Attention Mother Fucker (1973). Dance or Exercise on the Perimeter of a Square (1967-68) marked the beginning of the end of Nauman the mathematician, in which he trained before applying the theories to art. By the same token, because what Nauman creates in the artist’s studio is therefore always art, even when it’s math – whatever is presented to us in a museum must, by rights, be the same. And perhaps that’s the best take-away ever. The following day I wandered into the Sarah Lucas show at the New Museum on The Bowery and I thought back to the movement that made her famous – the YBA, or Young British Artists. The upstart conceptualists of the ’90s’ British hubris, financed by a Saatchi. This was a place where each artist had their own signature piece which they then marketed. I thought of Rachel Whiteread’s signature work, casting the negative spaces of bathtubs and houses, libraries and sheds. And Tracey Emin’s signatures in neon and her films of herself, talking to herself. The moving body casts of Sarah Lucas as a statement of existence and the human condition. Marc Quinn magically recreating his own body in blood or lead. And images of horses galloping. Of Turner prize-winning lights going off and on. Then I think of influence and continuing unspoken languages. Then I think of Bruce Nauman. Carl Oprey is a freelance writer living in New York where he produces prose and scripts, and teaches at NYU. 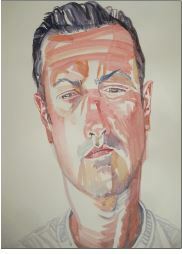 Originally from Liverpool, England, he received his MA in Creative Writing from UEA and his first degree in fine art. Carl recently completed The Boy Who Made the King Cry, a work of creative nonfiction, research-heavy and based around real events in New York and Liverpool. You can read more about him in About Us.